Model T Ford Forum: Ahooga! Model T Ford Forum: Forum 2018: Ahooga! The visual impact of a Brass-Era automobile is so striking, it can overshadow the other senses, which is kind of a shame because the way these cars sound is also wonderfully unique, and everyone who works with them just loves the low-revving grumble of a long-stroke engine and the kisskisskisskiss idle of an L or T-head. -Oh, but the horns! 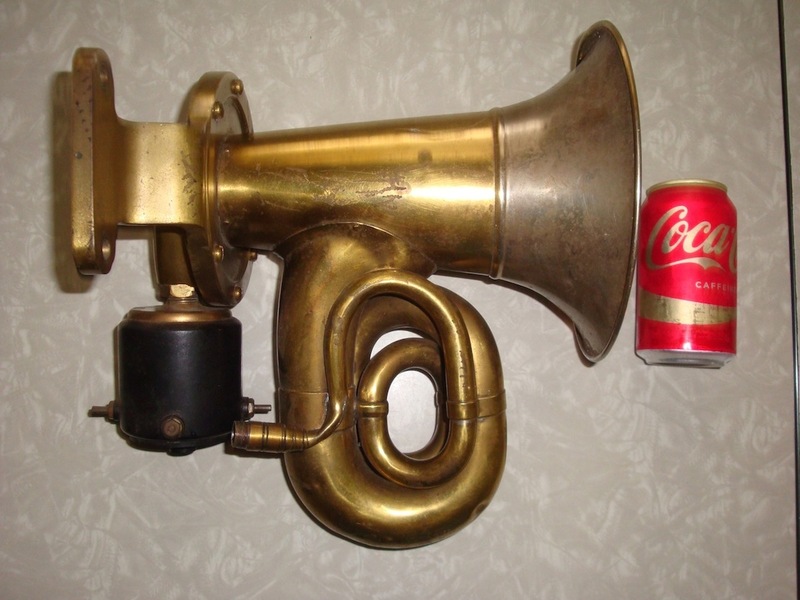 -I was surprised to learn that Klaxon "Ahooga" horns had been marketed fairly early in the game—1908—which coincided with the very earliest production of Henry Ford's Model T. -I had thought that those early days had been the sole domain of the squeeze-bulb horn. -Not so. 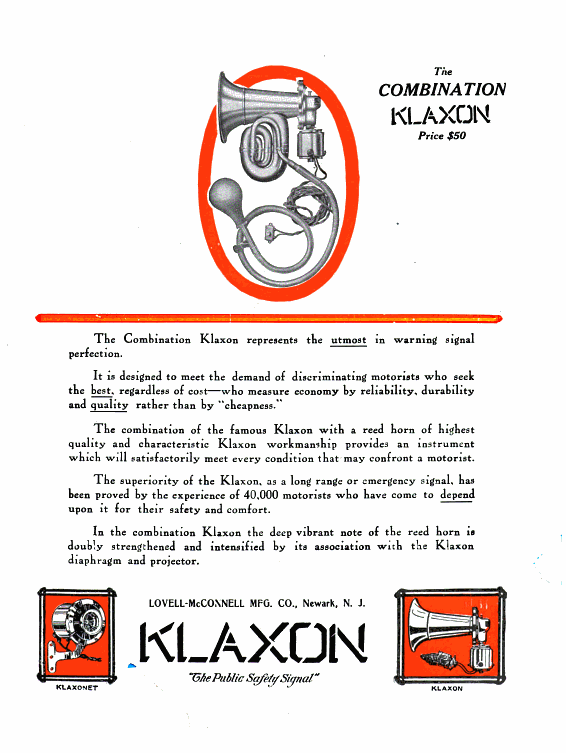 A typical Klaxon ad read, "To the motorist who has not used a KLAXON, its harsh metallic blare often seems unnecessary. -But the motorist who has used one knows that no other signaling device ever used on an automobile compares with it as an insurance against collision and an aid to sustained speed. "To the KLAXON user, blind crossing and hidden turns are virtually non-existent; his approach is heralded in ample time for unseen traffic to make way. -Heavy vehicles going the same way are signaled long before they are overtaken, and turn out in season to require no slackening. -On steep, winding hills, a KLAXON may be the sole protection against disaster. "The value of the KLAXON as a safeguard and a time-saver for the conservative motorist was never better attested than in its adoption by President Taft on the White House automobile." Indeed, President William Howard Taft did have a White Steamer equipped with a Klaxon horn prepared for his 1909 inauguration. -This was the very first use of an automobile by a U.S. president, the purpose of which was to enhance the acceptance of motor vehicles and boost the sales of their generally Republican-voting manufacturers and stockholders. -To that end, Mr. Taft's chauffeur was encouraged to attract as much attention as possible by making a habit of driving at an unheard of (in 1909) speed of 60 mph, with the Klaxon blasting away to warn off horse-drawn traffic. It's good to know that these horns are period-correct for fairly early horseless-carriages because... well, I've always felt a little like it was cheating to have a hand-Klaxon instead of a squeeze-bulbed Mr. Magoo horn on my '15 Ford, for contrary to popular belief, Henry never offered Ahooga horns as Model T equipment. -My defense for the compromise with historical accuracy had been a pretty weak excuse; simply that car-show spectators loved the sound of darned thing and expected antique cars to have them (Okay—it also happens that the distinctive sound of these little beauties is so loudly raucous and attention-getting that from a safety standpoint, they're a good thing to have in busy traffic). Today, genuine antique Ahooga horns made under the Klaxon and Klaxonet name (and very good knock-offs like "New Tone") are most easily found on E-bay where prices for original, hand-operated and electric units generally range between $125 and $275. .......and the ones from Harbor Freight sound like a soprano cat being tortured. The reason is the high speed permanent magnet motors they use in those things. Now, running it at 6 volts improves the sound somewhat, but it's still more of a shriek than an "ahooga". I had one on the shelf and started playing with it. I found that an 8 volt battery was unacceptable, so I disassembled the thing and used my grinder to remove one of the two raised lumps on the motor shaft. This cut the impacts in half and the horn sounds much better.....almost acceptable. Period photos from the mid-teens often show a Model T wearing an aftermarket mechanical horn. It was a popular item because it's louder than a bulb horn or a magneto horn. Thank you for that interesting background on the Ahooga! Many years ago in Fla i bought a all brass Klaxonet 6 volt with a patent date of 1908 on it.Bud. I have 8 or 10 right angle electric Klaxon's if anyone is looking. Very cheap just cleaning out the barn. I have the best of both worlds. Found it in my neighborhood. Thanks for sharing the history! As Steve pointed out above, many period photos from the mid-teens show Model Ts with the aftermarket mechanical horns. And concerning your 1915 -- I would recommend you change your answer from, " My defense for the compromise [of a hand Klaxon] with historical accuracy had been a pretty weak excuse; simply that car-show spectators loved the sound of darned thing and expected antique cars to have them (Okay—it also happens that the distinctive sound of these little beauties is so loudly raucous and attention-getting that from a safety standpoint, they're a good thing to have in busy traffic). 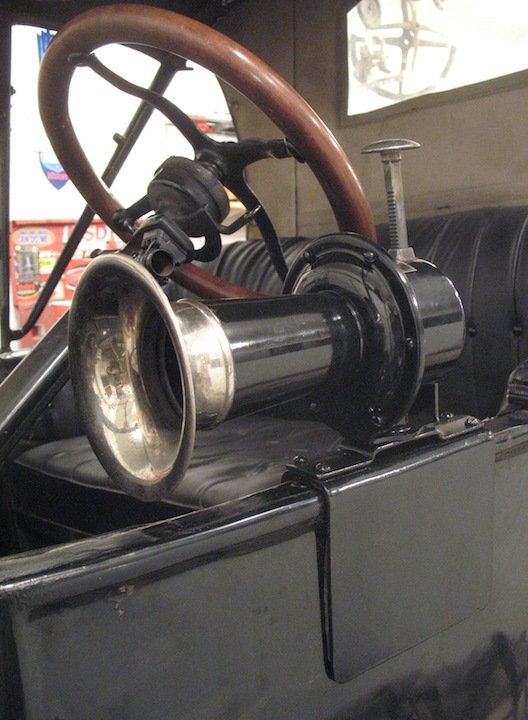 Because Ford put the bulb horn under the hood when the 1915 metal cowl was introduced it tended to muffle the sound. So much so that many original owners installed a hand klaxon or similar horn on the false door. This was so wide spread and so many early photos and surviving original cars had them that as late as the 1971 book "From Here to Obscurity" on page 147 they shared "The horn is now a hand-operated Klaxon, painted black with a brass end-bell. The fist of the '15 cars had a bulb horn, similar to the '14s but mounted under the hood." So technically Ford's move to steel cowl and mounting the bulb horn under the hood help promote the Klaxon style horns. Eric, that is an awesome looking horn. How does it sound?